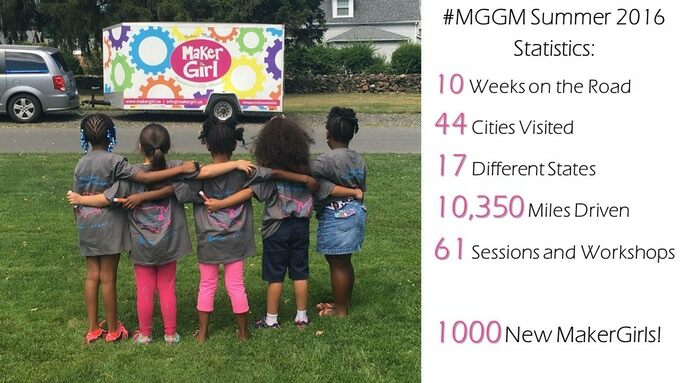 During the Summer of 2016, MakerGirl launched #MakerGirlGoesMobile, the first nationwide STEM education mobile 3D printing tour. The goal of this tour was to help us reach a more diverse group of girls, to help us find new locations to pilot MakerGirl Academies, and to build awareness for MakerGirl and 3D printing in general. Our 61 sessions were held in rural cities, to expose young girls to 3D printing and technology that is not readily accessible where they live. With our fully equipped mobile unit of Ultimaker printers, laptops, and session materials, our team was able to host a MakerGirl session at any location. Our sessions were held at MakerLabs, FabLabs, elementary schools, summer camps, and so many more awesome places. MakerGirl team member Kendall wrote about her experience with #MakerGirlGoesMobile, and you can read about it here.